I learn the most interesting things while Hubby and I are just driving around. Me: Why can’t I have a dog? Hubby: We live in a one bedroom apartment. Hubby: I will NEVER own a purse dog. Hubby: A purse dog, a dog that’s so small it can be carried around in a purse. I’m not that guy. Me: Fine, we’ll move to a bigger place and then I can have a dog. Hubby: Have you forgotten about CIA Cat? She will never allow us to have a dog. She will destroy any dog we bring home, it won’t have a chance. Me: If we get a puppy maybe they’ll have a chance to bond and become friends. Hubby: HA! That’s cute. Babe seriously you don’t want a dog, only psychopaths own dogs. Hubby: I watched this interview with a psychology specialist who was describing different signs of a psychopath and owning a dog was on top of the list. Hubby: No, I’m serious he wrote a book about this and everything. Me: What show was he giving this interview on? Hubby: Shut up! He was a legit doctor. Me: No, I believe you honey. AAAAHHHH!!! Look out old psychopath dude on the right walking his dog. AAAHHHH!!! Little girl psychopath to the left with her puppy. OH MY GOD! A whole park of psychopaths! Hit the gas Hubby, we’re all gonna die!! Hubby: That’s a dog park. Me: I know and right next to a pre-school those sick city zoning bastards! Hubby: Well now we’re never getting a dog, I hope it was worth it. This entry was posted in CIA Cat, Humor and tagged cats, dogs, Fashion, fun, funny, Humor, kids, life, marriage, psychopaths, purse. Bookmark the permalink. Hilarious. If you and hubby have these kinds of conversations in the car, what do you talk about in the bedroom? I’m not gonna lie, it can get weird. 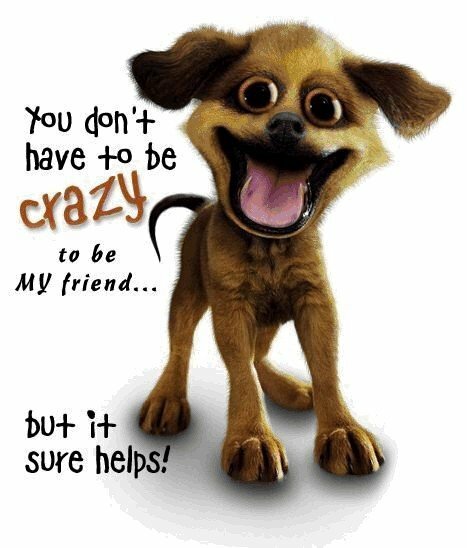 Funny post and I love the wacky dog picture!